Scrub the mussels and debeard. Place in a bowl of cold water with a handful of flour or oatmeal. Leave for 30 mins then drain and rinse the mussels. Place the butter and shallot in a large pan and cook until soft. Add the lemon juice and then the mussels cover and cook quickly. Until the shells open shaking the pan while cooking. Remove the mussels and keep warm. Strain the cooking liquid and put it in a clean pan. Add the cream and bring to the boil for 5 mins until thickened slightly. 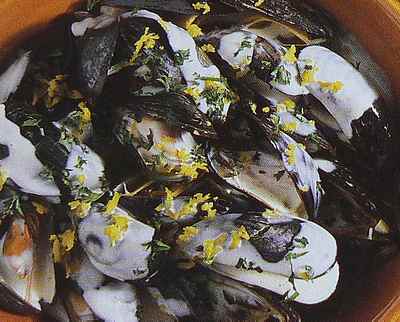 Pour over the mussels and sprinkle with grated lemon rind and the chopped parsley then serve.